This British pub classic is so easy to make and is absolutely delicious with lots of our rich and tasty shallot gravy. We’ve tried out lots of different vegetarian sausages and the Cauldron sausages are one of the best. The other ones that Matt and I eat quite a lot are the Linda McCartney sausages, which are equally delicious. Preheat the oven to 220 degrees Celsius / 428 degrees Fahrenheit / Gas mark 7. Put the sausages in a casserole dish with 1 chopped shallot and the rapeseed oil, and sprinkle with the rosemary and thyme. Then put the casserole dish in the oven and roast for 10 minutes. Whilst your sausages are roasting, you need to make your batter. Firstly add your flour and salt to a large bowl, and then beat in your eggs and milk, until the batter is smooth, with absolutely no lumps. 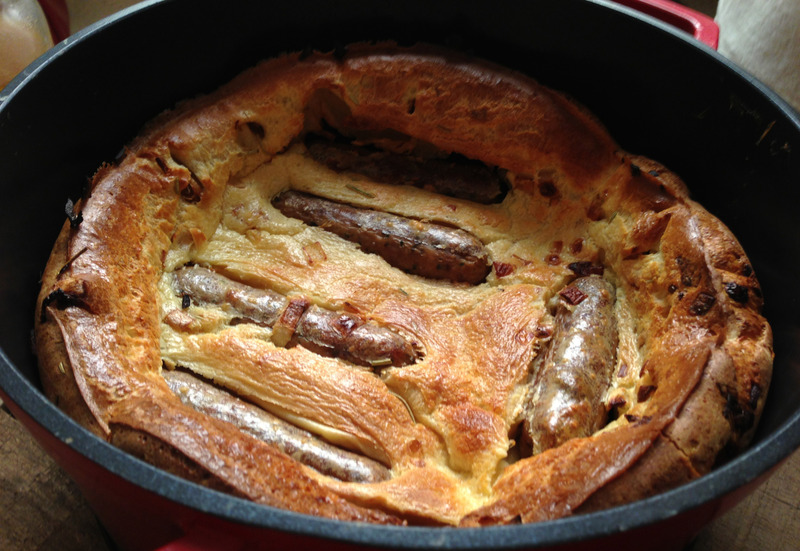 Take your sausages out of the oven and pour in your batter, making sure there is space between each of the sausages. Then put the casserole dish back in the oven and leave for 35-40 minutes, or until the batter is puffed and golden brown. 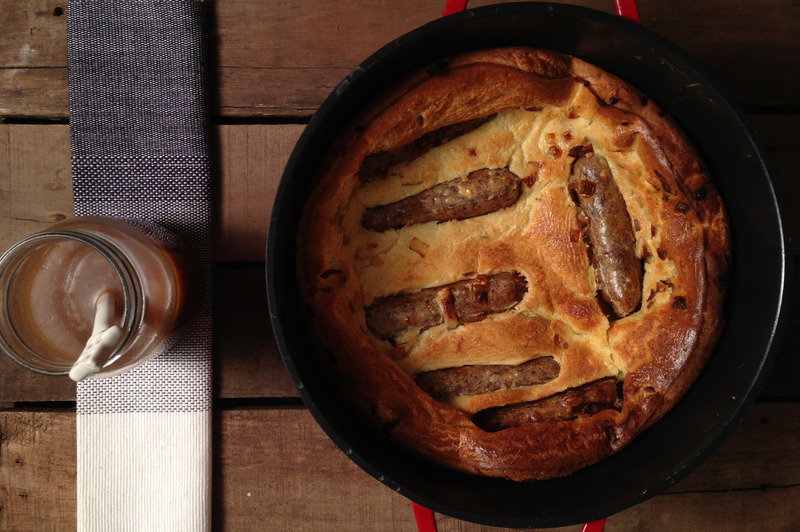 Whilst the toad in the hole is cooking, you need to get your shallot gravy started, so put a saucepan on a medium heat and add in a glug of rapeseed oil. Add in the 2 shallots and leave to cook for 10 minutes until they start to brown, making sure you are stirring regularly, so that they don’t stick to the pan. I’d love to download your book but I’m not on Facebook. Is there any other way to get it?